Newly remodeled, modern, yet cozy at the same time. Gorgeous wood floors, modern art-deco furniture, all with a nautical Montana theme. This impeccably clean home boasts a ton of character. This space sleeps up to 6 - one queen bed in the master bedroom, one queen bed in the second bedroom, and a sleeper sofa. Full glass shower in master bath, stack washer & dryer in half bath. 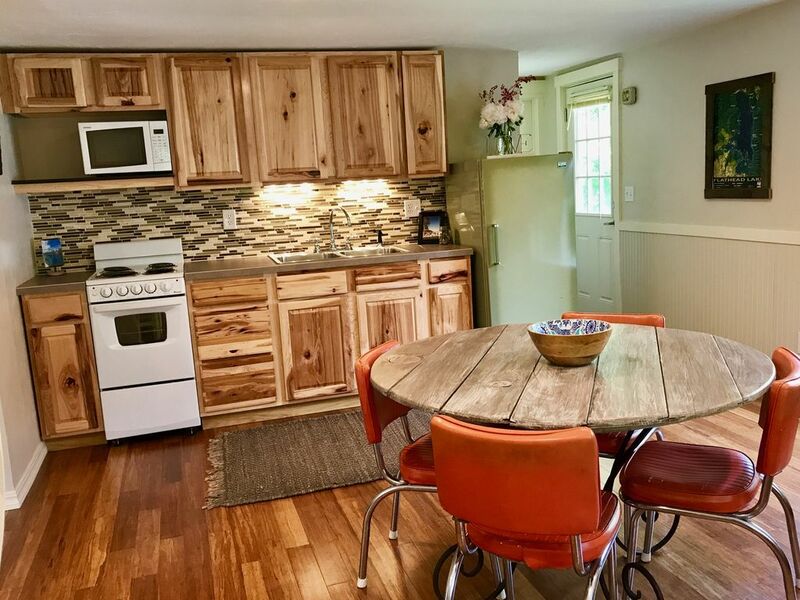 Full kitchen with all the amenities. 45 minutes from Glacier National Park and easy access to other outdoor activities. All guests also enjoy access to our private beach on Flathead Lake! Dogs are welcome. Hello, I'm Jenny. My husband Chris and I love all things Montana... and we own Flathead Lake Resort with a wonderful partner. We bought this beautiful home nestled in Woods Bay, MT in 2017 and have loved having it as part of our offerings. We enjoy hosting people and appreciate all the adventures Montana has to offer. We are avid travelers and adventurers (white water kayaking, backcountry skiing, water skiing, mountain biking, hiking, camping, exploring, you name it- we do it all!) If you have questions about all the magic Montana has to offer we are thrilled to share what we know. We are in tune with what our guests want and need to have a memorable get away! We live less than a mile away from the resort, so we want to share the beauty of our magical little mountain town with others. Access to a private beach on Flathead Lake. Only a 2 minute walk from the cabin. Our private beach is just a short 2 minute walk from your cabin. Enjoy lounge chairs, picnic tables, and more! Beautifully appointed with all amenities. Dine in kitchen with breakfast bar. Coffee maker, blender, cooking utensils and full dish setup! Dining table in kitchen seats four, bar space seats 3 additional. Daily kayak and canoe rentals available for guests. Daily bicycle rental available for guests. This cabin is part of Flathead Lake Resort, so guests are welcome to use the newly renovated bath/laundry house, free wifi, and private beach. We also have kayaks, bikes, and other equipment for rent, so stop into the office and we'll get you set up with what you need. clean and comfortable, nicely decorated. We enjoyed our stay at this comfortable little cabin. The staff were incredibly kind and helpful!